Some more photographs taken at the Museo de la Patagonia “Francisco P. Moreno” during my trip to Bariloche over the Christmas long weekend. They are both related to the 1922 Plesiosaur Expedition. 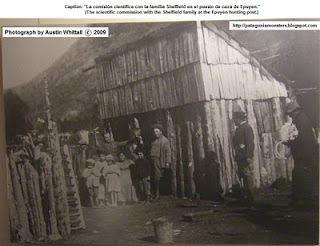 The first photograph shows the “hut” that the Sheffield family lived in. I guess (as the image’s caption says nothing), that Juana Sheffield is the girl sitting on the left of her mother with her smaller brother (and sister?) in front of her. To the right, Mr. Frey is leaning against the hut (wearing a wide brimmed hat). The second photograph shows the 1922 Expeditonary team sent to hunt the Plesiosaur (Previously I have posted some photographs of some of those involved in the Plesiosaur expedition). 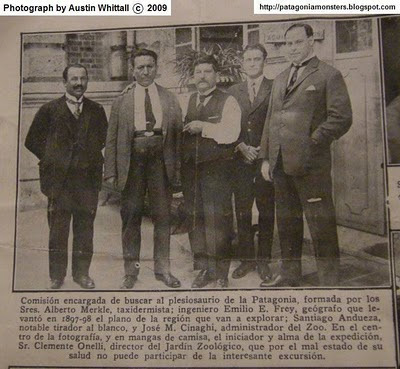 They are, from left to right: Alberto Merkle (Taxidermist), Emilio Frey (Leader of the Expedition), Clemente Onelli (Zoo Director), Santiago Andueza (Expert shooter) and José Cinaghi (Zoo Administrator).